VAP employees preparing “Warm Care Packages” containing blankets, warm socks, gloves, scarves, hand and feet warmers, bottled water, snacks, knitted hats, information about St. Vincent de Paul and how they can receive support and help from them, a list of local food pantry’s and their hours, and a personal note of encouragement from VAP Team Members. 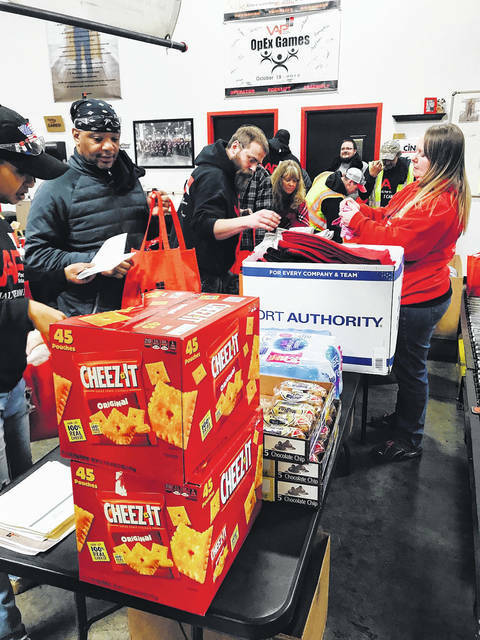 ENGLEWOOD — Team VAP, Value Added Packaging, Inc., located in Englewood, spent the month of January collecting needed items to build VAP Warm Care Packages for homeless individuals in the community. The Warm Packages included blankets, warm socks, gloves, scarves, hand and feet warmers, bottled water, snacks, knitted hats, information about St. Vincent de Paul and how they can receive support and help from them, a list of local food pantry’s and their hours, and a personal note of encouragement from VAP Team Members. “This has been a really great way to start the 2018 year off by helping our homeless neighbors in our community and hopefully brighten their day when we personally hand deliver the Warm Packages to them together as a Team,” said Mari Wenrick, chief champion of culture at VAP. A group of VAP Team VAP Members will head out the first of February to personally deliver the Warm Packages to those who need our help and support this time of year. All additional items that were collected by the VAP Team will be donated to St. Vincent de Paul. ● Provides 130,000 nights of shelter to approximately 4,000 homeless men, women and children. ● Successfully exist more than 1,300 homeless people to permanent housing. ● Feed more than 50,000 area households. ● Manages and provide case management services for 92 units of housing for very low-households. ● Assist more than 800 homeless persons transition to sustainable employment and permanent housing. ● Enable more than 1,000 area households avoid homelessness through emergency financial assistance. ● Provides 1,500 very low-income households with basic furniture. VAP is a custom box manufacturer and packaging provider in the Tri-State Region. VAP believes in changing the way its customers buy packaging, so it is pain-free and seamlessly integrated in to their product and processes in a caring and cost-effective way. This allows customers to focus on what they do best. VAP is a service company in a commodity world.